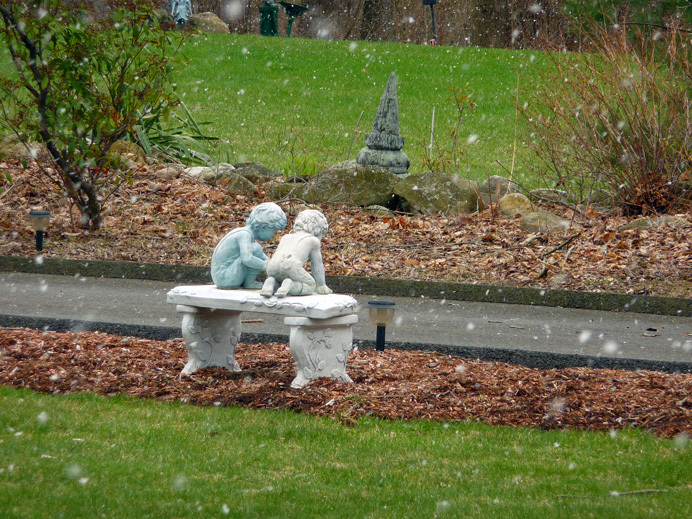 A freak April squall turned this lawn sculpture on Middle River Road into a real-life snow globe today. The air temperature was 41 degrees. Flakes landing on the pavement melted in five seconds. Those caught in the grass lingered longer, sometimes flitting from blade to blade in the wind. The gray cone in the background, about which I always imagine the children are talking, is a concrete gnome who, like me, has gone gray with age. Unlike me, however, he never seems to roam.